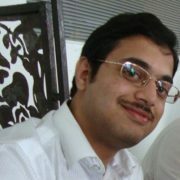 I am a research developer with the Applied Sciences and Engineering group at MSR India. I work primarily on machine learning projects. In last few areas, I have worked on ML projects in Delve/Office graph, email relevance and reviews ranking to name a few. Before coming to MSR India, I did a short one year stint at Yahoo Research, Bangalore. I was a developer in Bing team at Microsoft India Development Center for three years before this. I completed my Masters in Computer Science from IIT Bombay under Prof. S. Sudarshan.